She's Fantastic: Lord of the Rings ARWEN! Lord of the Rings ARWEN! Arwen Undómiel is one of the many characters that were given more prominence in the Lord of the Rings film trilogy than they had in either the books or earlier adaptations. In the book, she played the minor token "princess-type" role and was written out of the 1978 animated movie altogether. But Peter Jackson saw the potential in the beautiful Liv Tyler's portrayal of Arwen and elevated her to a major character in the trilogy. Toy Biz released this action figure right away via a 2001 deluxe box set with her horse, Asfaloth. This same set was re-released 3 years later in 2004, with a single pack release in-between in 2003 (As a part of Fellowship of the Rings, Series 2) I think this figure is one of the best of all the Toy Biz Middle-Earth ladies, however she is terribly out-of-scale with everyone else in the line. 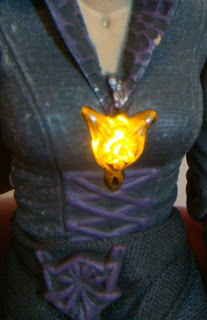 The detail of the sculpt (especially her hair and the woven embellishments of her coat) are stunning. I also don't disapprove of the integration of real cloth skirts... and I'm usually a major cloth-hater. It seems that the only difference in the different packaging of Arwen is that the single-packed version comes with a sword. I believe they both feature the "light-up Evenstar" feature in which a button on her back makes her pendant glow. My batteries are dead, but I found a picture from an online auction showing it lit up (down below). My Arwen unfortunately does not have her sword either. I think the likeness to Liv Tyler in the movie is fantastic. And Finally, here is a group shot. It is such a shame that she dwarfs all the other figures. She has a higher level of quality than the other females in the line, but the scale makes her the odd woman out. I liked this version more than the one with the long green dress, though the green dress was not without it's charm. 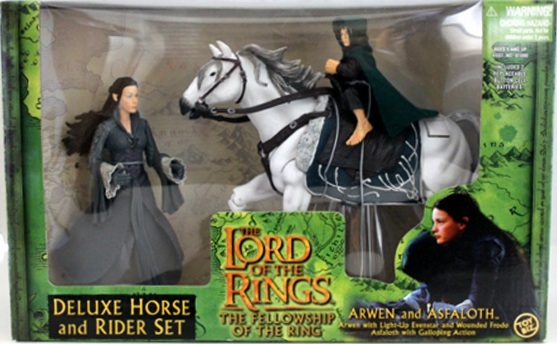 I still remember being in awe at how amazing these figures were (& still are), especially Galadriel & Arwen. The horses/beasts in the line were fantastic too. I have Asfoloth & some Writh horses stuffed in the bottom of my closet with the large talking Treebeard (they did make a smaller version didn't they?). Though everything else went out to storage years ago. I just reviewed the coronation gown Arwen a few minutes ago.. totally agree, I prefer the purple version, but I am so glad the green one exists (if nothing else than for scale). I don't own any of the horses, but they look very nice. I would love to see them compared with the MOTUC Swiftwind. I don't have any of the treebeards, but they remind me of the Inhumanoids Redwoods which I have a major softspot for. I can't wait to review the rest of the LOTR ladies but I think I have to take a little break and come back to them.